Michael Bay's Transformers: Age Of Extinction is looking for a new lease on the franchise's life. In order to have that, he and his team have gone out of their way to distance this film from the tone of the previous installments. Mark Wahlberg is leading instead of Shia Labeouf, the basic spirit of the film looks to be deadly serious with familial overtones, rather than the overtly jokey/romantic, as we saw in the first movie. Most importantly, instead of using Linkin Park as the series' musical muse, like he has in the past, Imagine Dragons are taking over the pop music connection between the series and the world. Cementing this partnership is their newest single, "Battle Cry", which was written especially for the film itself. Following an early footage screening of the film, Imagine Dragons wrote the original song ""BATTLE CRY," which Bay used in critical points in the film. Additionally, the band contributed original music during the scoring process by recording cues with Jablonsky, the film's composer, and Hans Zimmer, who assisted in the process. The collaboration resulted in added depth to the sound of the film. 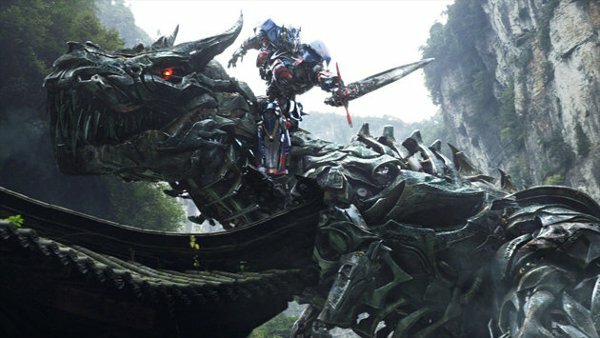 We've seen something similar to this in Transformers: Revenge Of The Fallen, as Linkin Park's "New Divide" was used for the cue N.E.S.T. in Steve Jablonsky's score for the film. It looks like Michael Bay is emulating that same formula, except more extensively and with a different (and arguably better) group. Imagine Dragons are certainly no strangers to the film scene as they've been featured in opening to The Incredible Burt Wonderstone and the advertising campaign to The Host, which featured a remix of their hit song "Radioactive". To be honest, "New Divide" is the only Transformers single I enjoyed out of the Linkin Park era, as "What I've Done" and "Iridescent" were ok songs on their own, but nothing close to the epic track that "New Divide" was. Dare I say, they were even whiny compared to the bravado that the second film's featured song had. "Battle Cry" is not only a welcome return to a Transformers single that doesn't sound like it's advertising a CW drama for Teens, it's enhanced by the greater talent of Imagine Dragons. Even if you're not the band's biggest fan, you can at least admit that they're a better, more consistent act than Linkin Park. "Battle Cry" will be unveiled at the Transformers: Age of Extinction world premiere in Hong Kong on June 19th; after which it will probably be released as a single to the public in anticipation of the soundtrack album's eventual release. No official details have been provided with specific dates for the release of either the single or the soundtracks, but Imagine Dragons themselves will be on hand to play the live concert at the premiere, and fans will have a chance to win a spot at the premiere by tweeting the hashtag #TransformersPremiere on their Twitter feeds.